It was 1947 when Yarcombe and District YFC in Devon first opened its doors to young farmers in the local area. Seventy years later and the Club is still going strong and has just celebrated its platinum anniversary with a black tie ball for 500 people. The event also helped to raise money for two of the Club’s charities, Exeter’s Neonatal Unit, Musgrove’s Neonatal Unit and Over the Wall. The celebrations didn’t end there as on the following day, the Club held a celebratory lunch for 400 past, present and future members. The guest speaker was former NFYFC activities chairman James Morrish, who is now a Kivells Auctioneer. A commemorative photo was taken of the chairmen, secretaries and treasurers from the past 70 years, thanks to Martin Smith Photography. Two of the founding members, John Salter and Margaret Wyatt, also posed for a photo with the current Club Chairman Liam Dare and Secretary Sarah Broom. 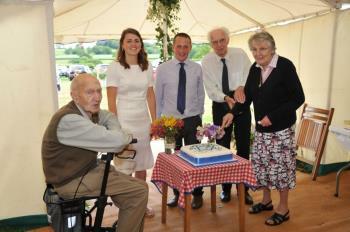 Press Secretary Laura Dare said: “A thoroughly enjoyable weekend was had by all those who attended. A massive thank you to all those who supported the weekend. The club is in such a strong position because of the people supporting it and without the support we would never have been able to celebrate the 70th Anniversary in the way we did."